Gather at Volcanoes National Park headquarters Kinigi after breakfast at your place of stay to catch up with briefing at 8am local time. If you arrive early before, you have an opportunity to attend to the impressive Kinyarwanda dance performance and drinking a hot cup of Rwandan coffee till the briefing time. 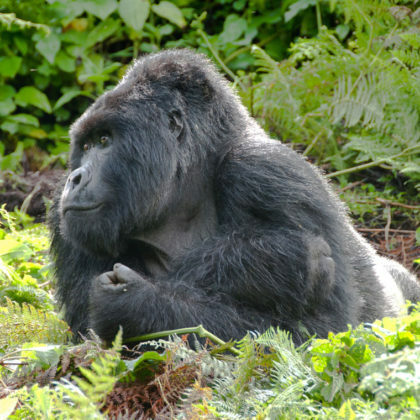 You attend to briefing our respective gorilla groups allocated to you on spot and then embark on the drive to trail heads of each gorilla family. You head to the slopes of the volcanoes in search of these critically endangered apes. 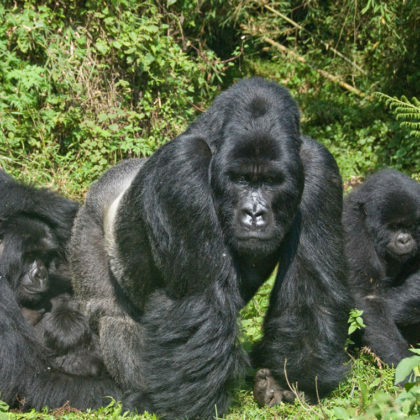 You have one hour with them gain at them as they forage, socialize and the silverback demonstrating its manhood. 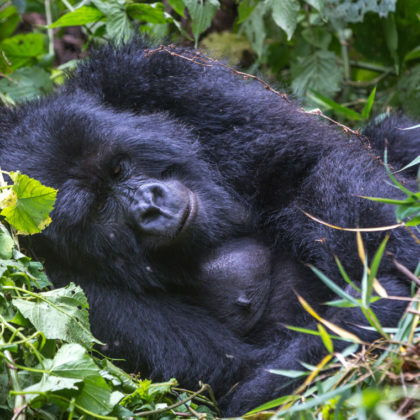 The encounter tends to last 2 – 8 hours depending on the gorilla movements and the gorilla family allocated to you. Retreat from the activity and cross to Uganda for relaxation, dinner and overnight. 100km to Ruhija and 53km to Rushaga and Nkuringo. Arrive in the evening for relaxation, dinner and overnight. have got impressive traditions that are worth exploring. You attend to their cultural performances and retreat from the activity for relaxation, dinner and overnight. 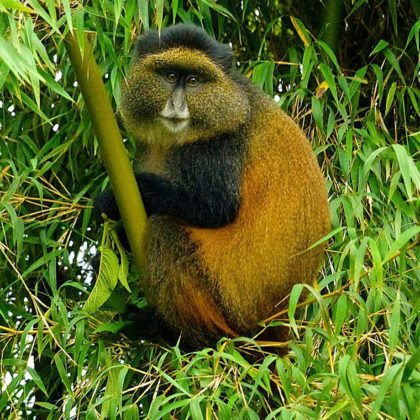 Embark on the drive to Queen Elizabeth National Park in the north of Bwindi 160km from Buhoma, 218km from Ruhija, 309km from Rushaga and 316km from Nkuringo. You will drive through impressive rural landscapes of Kihihi and Kanungu before arriving in the Mweya Peninsular where you gather at the Mweya jetty for an afternoon boat cruise starting at 2pm for Marasa and 3pm for UWA with the interval of 2hours to make a round trip for another turn. The encounter offers you opportunity of encountering the Nile crocodiles, the Hippos and water birds along the channel. The wild game also tends to come to the channel shores to quench their thirst. Retreat from that and do a game drive along the channel track as you connect to the lodge for overnight. Drive to the rolling plains of Queen Elizabeth National Park with its extensive savannah grassland for amazing game viewing experience after breakfast. The drive through the Kasenyi tracks enables you to explore a range of game including the elephants, lions, buffaloes, leopards, water bucks, side stripped jackals among other species. 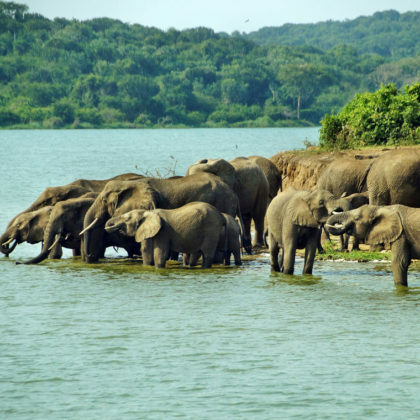 The activity tends to last 3 – hours after which you will embark on the transfer to the southern sector of Queen Elizabeth National Park named Ishasha. 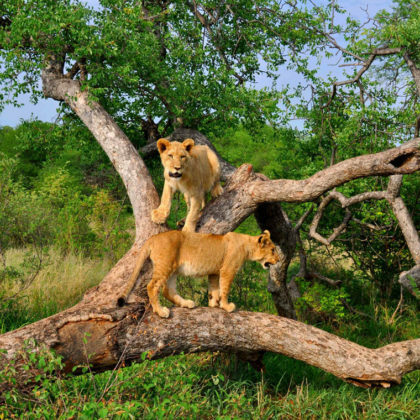 You undertake a game drive in Ishasha sector in search of tree climbing lions that tend to lie on fig tree branches overlooking their prey in the plains. Retire for relaxation, dinner and overnight. After breakfast embark on the transfer back to Kigali. You will drive through impressive Kigezi highlands dubbed the Switzerland of Africa and the impressive hill sides of Rwanda dubbed the land of a thousand Islands. 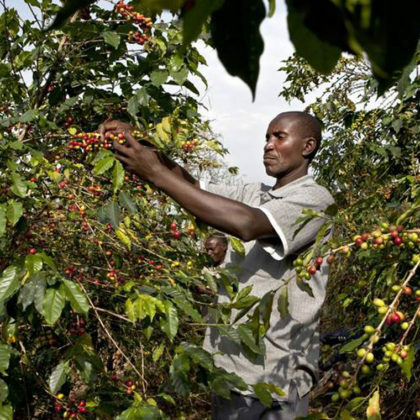 You undertake coffee plantation tour en route in Kanungu district exploring the coffee growing practices right from planting to maintenance, harvesting, processing and eventual use. You participate in the process like harvesting and gain an authentic touch of the local coffee growing and enjoy the themed interpretation from the local farmers explaining the significance of coffee and its cultural attachment especially its use in extending friendship among individuals. You arrive in Kigali in the evening for relaxation, dinner and overnight. 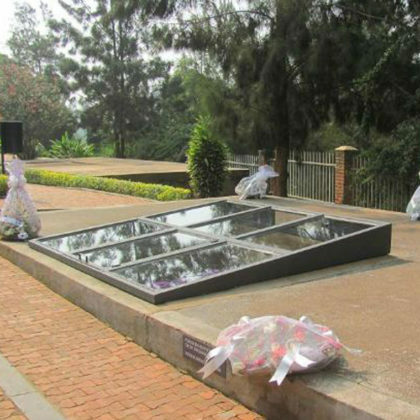 This day is dedicated for your departure but if the flight is in the evening, embark on the tour to the Kigali genocide memorial exploring the historic living museum of the horrific genocide that befell Rwanda in the year 1994. It is the greatly visited genocide memorial in Rwanda and it features a detailed themed interpretation of the entire occurrence. Retreat to connect to Kigali International Airport for flight departure.